To see more photos from the 2010 Crossroads Festival, please visit our BluesPowR Gallery. Eric Clapton and his friends sure are getting good at putting on a show, as they proved once again Saturday during the third installment of Clapton’s Crossroads Guitar Festival at Chicago’s Toyota Park. Not all of the acts were blues artists, of course, with the line-up also including the jazz stylings of Earl Klugh, country’s Vince Gill, and pop and rock acts the likes of Sheryl Crow and Jeff Beck. But the day did offer many of the genre’s biggest names, plus a number of acts with either a strong blues component or that included blues men/women among the performers. 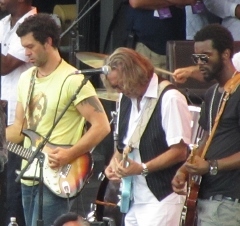 Doyle Bramhall II, Eric Clapton, Gary Clark Jr.
Doyle Bramhall II showed off a new band, accompanied by fellow Austinite Gary Clark, Jr. (who some might remember from his role in the Honeydripper motion picture) and later by Sheryl Crow (who noted Crossroads as her “favorite gig in life”) for her hit “Everyday is a Winding Road.” The stage started to get a bit crowded, as they were first joined by Derek Trucks and Susan Tedeschi for a new song from Sheryl and then added Clapton. Next up was country music’s Vince Gill, along with a few friends in Keb’ Mo’, James Burton, and Albert Lee. Starting off on Gill’s “One More Last Chance,” the group soon moved to the blues, first with Junior Parker’s “Mystery Train” featuring Burton and then a few numbers from Keb’ Mo’ (“The Door” and “As Soon as I Get Paid”) before Albert Lee took the lead with his daughter on vocals. 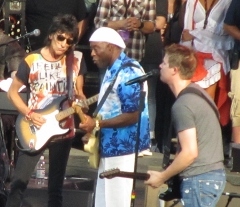 Hometown hero Buddy Guy was out next, along with Jonny Lang and special guest Ronnie Wood, for a set that started on a Lang-led “Forty Days and Forty Nights” and included “Let Me Love You Baby” as well as Guy and Lang trading vocals and licks on “Five Long Years.” We were hoping the two might have a chance to revisit their “Midnight Train” pairing, but were instead treated to a mostly instrumental version of the Rolling Stones’ “Miss You,” including a mid-song switch to Buddy’s famous polka dot guitar. Derek Trucks and Susan Tedeschi returned for their portion of the show, and were soon joined by Warren Haynes (of Allman Brothers Band and Gov’t Mule fame) for a few tunes, including one of Haynes’ best in “Soulshine.” (The Allman Brothers Band was a late scratch from the line-up after Gregg Allman underwent an unexpected liver transplant last week.) Haynes & co. proceeded to welcome Los Lobos’ Cesar Rosas and David Hidalgo, who offered a lively “300 Pounds of Heavenly Joy” while Trucks and Tedeschi took a breather. 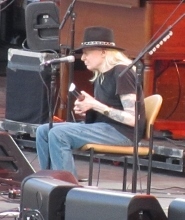 Trucks was back soon enough, as he helped welcome a slow-moving Johnny Winter to the stage for Jimi Hendrix’s “Red House,” which saw Johnny moving quite a bit faster on guitar once he hit his stride. With Tedeschi back on vocals and accomplished pianist and Clapton collaborator Chris Stainton on the keys, the group presented a terrific cover of “Space Captain” from Joe Cocker’s Mad Dogs & Englishmen tour, on which Stainton played the original. 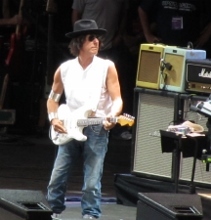 After noting that he’s “always had a thing for the pale ones” in regards to Winter, Murray brought on Jeff Beck, who gave a typically stellar show, with highlights including an instrumental “Somewhere Over the Rainbow” and a funky “Rollin’ and Tumblin'” featuring Rhonda Smith (who spent a decade with Prince prior to joining Beck) on bass and vocals. Unfortunately, it was getting to be time for the out-of-towners at Crossroads to try to flag a ride, so we ended up missing the Buddy Guy-led finale of “Sweet Home Chicago.” With any luck, we’ll see that – and many of the other moments and songs we’ve noted here – in either the festival highlights show being screened in select theaters across the U.S. in late July or the fuller DVD of the concert that will be available this fall. This entry was posted in Shows and tagged Albert Lee, Allman Brothers Band, B.B. 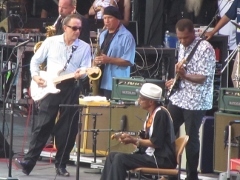 King, Bill Murray, Buddy Guy, Cesar Rosas, Crossroads Guitar Festival, David Hidalgo, Derek Trucks, Doyle Bramhall II, Earl Klugh, Eric Clapton, Gary Clark Jr., Honeyboy Edwards, Hubert Sumlin, James Burton, Jeff Beck, Jimmie Vaughan, Joe Bonamassa, John Mayer, Johnny Winter, Jonny Lang, Keb Mo, Michael Frank, Pino Daniele, Robert Cray, Robert Randolph, Ronnie Wood, Sheryl Crow, Sonny Landreth, Stefan Grossman, Steve Winwood, Susan Tedeschi, Vince Gill, Warren Haynes, ZZ Top. Bookmark the permalink.